Got the car back. Another $350 bucks down the tubes. And actually, I gotta take it to another joint later today for a more minor procedure, but still, here goes another few hours without the car, and another few bucks into the abyss. And on top of all that, I got another couple of job rejections yesterday. So this is what my life is like these days — shovel a few hundred bucks out the window, get turned down for jobs, read the news about another half-million people losing their jobs, and try to find something new to distract myself from thinking about how awful things are. Luckily, new comics = awesome distraction factor! 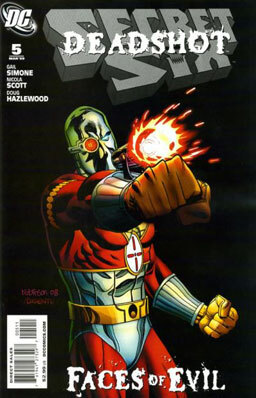 First of all, could I just say that I do not like DC’s “Faces of Evil” covers? Something a tad more colorful, por favor? 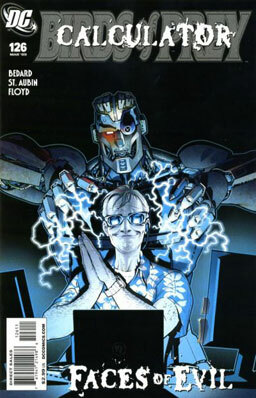 Anyway, it’s the next to the last issue of this series. The dastardly but extraordinarily nerdy Calculator has gotten on the bad side of the Kilg%re, a living computer program who’s allied with the Silicon Syndicate. Basically, the Calculator blundered and gave Oracle access to the Syndicate’s secret Internet — the Syndicate is unhappy, but is going to give him three days to kill the Birds of Prey before they kill him. Can Calculator figure out a way to come out on top? Well, yeah, that and more. And with Calc’s newfound power, do Oracle and the rest of the Birds stand any chance against him? Verdict: Thumbs up. Nice focus on the Calculator and the Syndicate, and Calc’s scheme is enjoyably baroque and twisted. Verdict: I think I’m gonna thumbs-down on this one. 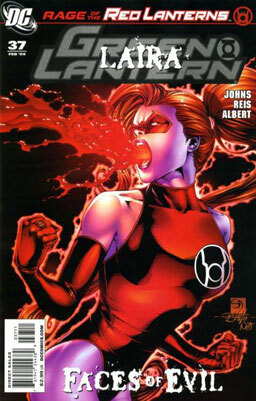 I’m really tired of the blood-vomiting Red Lanterns. And I’m not that fond of the Blue Lanterns either. And now that Hal has gone from a Green Lantern to a Red Lantern, with the Blues wanting him as their leader… Hey, do ya reckon, Hal is going to be wearing all seven of the power rings by the time this is all over? Aw, gee, did I figure out the big surprise already? The horrific Junior is going to kill Bane by throwing bricks at him. Five hundred bricks. But Bane is not without resources — namely, that even chained up and seemingly helpless, he’s really, really good at killing Junior’s henchmen. Meanwhile, Jeanette, the Last Victim and the owner of the Nocturne casino, forces Cheshire to give the rest of the Six the antidote to the poisons they were exposed to last issue. Then they all beat the snot out of the supervillains stalking them through the casino. Finally, they go to find Bane, and we get the revelation of Junior’s identity. It’s sounding like the Lanterns are turning into really screwed up Power Rangers. How long until we get a Pink Lantern, whose power comes from boundless glee? they need a Brown Lantern—what can brown do for you?